A historic landmark was lost today in Smethport. The Cottage House, built in 1899, burned to the ground in the early morning hours. As yet, no cause for the fire has been offered by the Smethport Fire Department or local police. The building was not occupied at the time of the blaze. Renters on the upper floor had been given notice a week ago to vacate the building in preparation for a change of ownership that would have reopened the business next spring after extensive renovations and expansion. 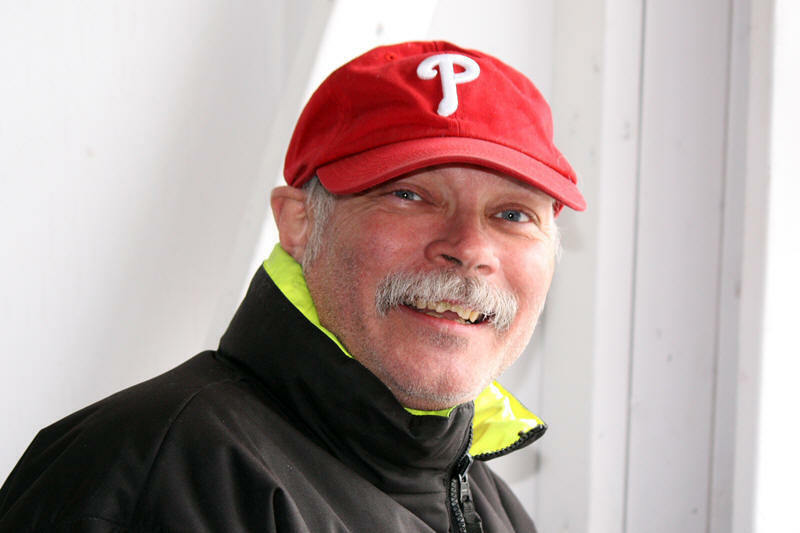 Mick Caulkins of Port Allegany was the owner of record at the time of the fire. He was about to sign a sales contract later in the day with Smethport resident Brian Gustafson who had agreed to buy The Cottage House. Property adjacent to the restaurant owned by Gustafson was being cleared in anticipation of the sale to make room for expansion. Gustafson is the owner of the Priority One ambulance service and other properties in Smethport. He is also a Borough Council member. Porter noted that The Cottage House was included in the first ten buildings placed on the Smethport Historic Registry, a local program that began in 2007. Fire Marshals from the region will investigate the cause of the fire, which some believe may have occurred under suspicious circumstances. According to Mick Caulkins, The Cottage House was insured for about $280,000, but this may not be enough to rebuild the structure. Borough leaders had been enthusiastic about the sale of The Cottage House, which had closed down in June. Reopening and improving the building was expected to have a ripple effect in Smethport by attracting more investment to the area. Smethport Web — by Les Jordan, Jr. Multiple sirens sounded in Smethport around 2:00 a.m. Friday morning as the Smethport Fire Department was dispatched to a fire at the Cottage House Restaurant on Fulton Street. When the firefighters arrived a few minutes later, fire and smoke were showing out of the back of the building and quickly spread out of control into a full structure fire. A brisk wind pushed the fire deep into the structure, one of Smethport’s landmarks, which was once a popular destination as the Fulton House years ago. According to fire policeman and Smethport council President, Greg Rounsville, smoke was already showing from the building when he looked out of a window at his home a few seconds after the siren sounded. It only took about a half an hour for the building to be fully engulfed, explained Rounsville. Several area fire departments responded with mutual aid on the scene. 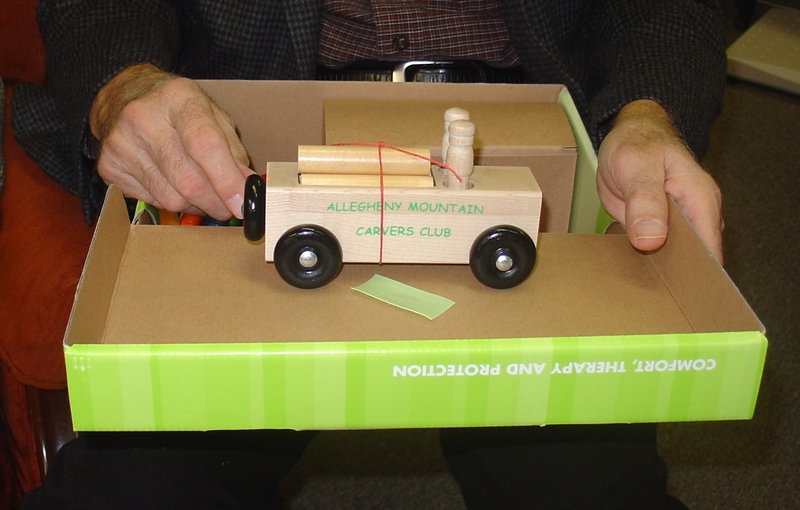 They included: Port Allegany; Eldred Borough, Roulette for stand-by at Smethport, Norwich Twp., and aerial trucks from Kane and Emporium. The popular restaurant had sat idle for several months. According to Rounsville, the Pennsylvania State Fire Marshall was in route to the scene to investigate the cause of the fire. Chrysler Group LLC is recalling about 76,000 Dodge Ram pickup trucks to fix a power-steering problem that could make brake pedals return slowly after the driver applies them, according to a recall notice issued by the U.S. Department of Transportation. The recall affects certain 2010-2011 model year Dodge Ram trucks built from March 2009 through October 2010. The Michigan auto maker said some trucks with diesel engines and a hydroboost brake system could be equipped with a power-steering reservoir cap with excessive vent pressure levels. The excessive levels could lead to brake pedals that are slow to return and cause the brake lights to remain on, potentially causing a crash. A Chrysler spokesman said no crashes or injuries have been reported. He said the problem was first noticed by dealers and a modified cap will relieve some of the pressure causing the problem. Chrysler said it will notify owners. Dealers will replace the steering reservoir cap free of charge. Owners can contact Chrysler at 800-853-1403. HARRISBURG – The Pennsylvania Public Utility Commission (PUC) today approved a plan to split the 814 area code along geographic boundaries to avoid running out of phone numbers, creating a new area code for customers in portions of northwestern Pennsylvania. The Commission voted 5-0 to split the area code along rate center boundaries. The new area code will be applied to Jefferson, Elk and McKean counties and west. The boundary runs in a north/south direction east of the rate centers Shinglehouse, Wilcox, Kersey, Dubois and Sykesville. Maps showing the county split and the rate center split are available on the Commission’s website. On June 9, 2009, Neustar petitioned the PUC for area code relief. Because of concerns over the disruptions changes to area codes can cause, the PUC held a comment period, followed by public input hearings. During that process, the PUC received significant input from the public supporting a geographic split. In light of that public feedback, the Commission said the geographic split for the 814 area code created less inconveniences than an overlay. Because of the geographic size of the 814 area code and the location of population centers, the Commission said the geographic split was more practical for the 814 area code. With the geographic split, consumers may continue to dial seven digits for local calling. The other option available to the Commission – an overlay – would have covered the entire 814 area code with a new area code and required 10-digit dialing throughout a large geographic area in Pennsylvania. The 814 area code is projected to run out of telephone numbers in the first quarter of 2013. New area codes are needed when existing area codes exhaust their supply of “NXX” codes (which is the second set of three digits in a 10-digit telephone number, NPA-NXX-XXXX). Of the original four Pennsylvania area codes, the 814 area code was only one to remain unchanged. With the split, Pennsylvania now will have 11 area codes – 412/878, 570, 610/484, 814, 724/878, 717 and 215/267. The actual new number for the new area code will be determined in the coming weeks by the North American Numbering Plan Administrator (NANPA), which is the neutral third party area code relief planner for Pennsylvania. The new area code will be implemented Feb. 1, 2012. The Commission will continue to closely monitor phone number demand in the 814 area code to determine whether the implementation timeline meets the needs within the area code. Harrisburg – The recent stranding of motorists in Indiana and New York due to severe winter storms carry a reminder that all motorists are responsible for their own safety when they choose to ignore weather forecasts and travel warnings, PennDOT said today. Motorists are reminded that during winter weather events, the department’s primary goal is to keep roads passable, not completely free of ice and snow. PennDOT will continue to treat roadways throughout the storm until after precipitation stops and roads are clear. Stranded vehicles only slow those efforts. • Pay attention to the weather forecast and postpone travel as necessary. • Heed all travel warnings and road closures. • Be prepared for rapidly changing weather and road conditions. • Be sure your vehicle’s tires are rated for mud and snow. In areas prone to heavy snow, consider using tire chains or snow tires. • Make certain the heater, defroster and wipers work properly. • Pack an emergency kit that includes items such as non-perishable food, water, first-aid supplies, warm clothes, a blanket and small snow shovel. About 5,400 PennDOT employees work hard to keep Pennsylvania roads passable during winter weather. PennDOT reminds motorists that roadways such as interstates and expressways will be its primary focus and at times, the department may redirect equipment to these routes during significant winter events. During these heavier storms, motorists may encounter deeper accumulations on less-traveled routes and they should adjust their driving for those conditions. PennDOT has agreements with more than 700 municipalities for them to clear state roads within their jurisdictions. The department also rents approximately 400 trucks and operators to assist with snow removal as needed. When preparing for snowy travel, motorists can check road conditions on more than 2,900 miles of state roads by calling 511 or visiting www.511PA.com. 511PA, which is free and available 24 hours a day, provides traffic delay warnings, weather forecasts, average traffic speeds on urban interstates and access to more than 500 traffic cameras. The 511 site also provides easy-to-use, color-coded winter road conditions for all interstates and other routes covered in the 511 reporting network. New this winter, PennDOT has added a 511 Twitter feed so users can subscribe to any or all of the 511 regions or choose to receive 511 alerts statewide. MOUNT JEWETT -- Visitors will get a look into the past from a new $4.5 million observation deck and walkway at the Kinzua Viaduct in McKean County in 2011. For small businesses in the region, the new skywalk could also mean a brighter future. The deck and walkway are being built atop six of the viaduct support towers left standing after the railroad bridge -- once the world's tallest and longest -- was wrenched into rubble by a tornado in 2003. From the octagonal observation deck, visitors who have largely bypassed the area since the viaduct fell will be able to look out over the Kinzua Gorge at three more viaduct towers still standing, or look down -- through a window in the deck floor -- at twisted remains of the bridge scattered up to 300 feet below. The towering deck will help new visitors understand the onetime scope of the bridge and the forces that brought it down, said Linda Devlin, executive director of the Bradford-based Allegheny National Forest Visitors Bureau. "The center towers of the viaduct were as high as the Statue of Liberty. When you see them on the valley floor, you really get the perspective of how huge, how massive, and how much of a marvel they are. The fact that wind could shear those off and twist them like dishrags is absolutely amazing," she said. The deck will also offer visitors a view of the environmental damage caused by the tornado that struck the park on July 21, 2003. "Looking across the valley from where this observation deck will be, there's a whole mountainside where, like dominoes, every tree went down in the same way. It's an impressive sight," said Terry Brady, spokesman for the Pennsylvania Department of Conservation and Natural Resources, which is overseeing the skywalk project. The region's tourism was ultimately toppled by the same storm. Though visitors initially flooded the area to see the fallen bridge, tourism has since plummeted, Devlin said. When the viaduct was intact, it was the region's No. 1 attraction, bringing in between 160,000 and 180,000 visitors from around the world each year. Since the bridge collapse, that number has plunged to about 20,000, Devlin said. With tourists went the money that they once spent in the region. The Allegheny National Forest Visitors Bureau calculates tourist dollars lost since the viaduct went down at about $3 million annually. And that's meant economic disaster for small businesses in the sparsely populated "Pennsylvania Wilds" region, Devlin said. "The effect on local businesses has been dramatic," Devlin said. "America's First Christmas Store (in Smethport) closed, a variety of small bed-and-breakfasts closed, and a lot of retail shops that depended on the bus tours that came through also closed. It's been a very big blow to towns like Mount Jewett." Mount Jewett is about four miles from the viaduct on Route 6. Connie Carlson owns the Kaffe Sol in Mount Jewett. The shop, at 3 W. Main St., specializes in homemade soups, sandwiches, and Swedish baked goods and maintains a guest book that visitors are asked to sign. Since the bridge went down, the signatures have been significantly fewer, Carlson said. "People that used to come up from the Pittsburgh area and down from New York state to spend the day don't do that anymore," Carlson said. "In summer, there's just nowhere near as much traffic. People still come through traveling Route 6, but now they don't stop at the bridge and just continue on through." Construction of the new skywalk and observation deck is the first phase of a larger project to attract visitors back to the Kinzua Viaduct. A new visitors center and a trail down into the gorge to the fallen bridge are also planned, but the time frame, for the visitors center especially, is fuzzy, the DCNR's Brady said. "It's all going to depend on finances," he said. The total cost for the new skywalk and observation deck could exceed the $4.5 million originally anticipated, Brady said. Work by Chester County-based contractor J.D. Eckman to shore up viaduct towers to support the new deck began in summer 2009 and was only recently completed. The project was delayed by weather, materials deliveries and more extensive repairs than originally anticipated, Brady said. "Once the contractor got in and started work on the towers, he found major rust and cross pieces that had deteriorated. And the weather, in that kind of work, can also cause delays, and did cause delays. You can't work on those towers in the wind or sleet or snow. "It took a lot more time than expected to repair and repaint the towers before work could begin on the observation deck," Brady said. Construction of the skywalk itself is just under way and could continue through winter, weather permitting. The deck and walkway could open to the public as early as spring if dry weather holds in the area. But that's not likely, Brady said. "Winter weather being what it generally is there, it's more likely that the new overlook will open by fall," he said. Devlin hopes that the new skywalk will be open in time for the Kinzua Bridge Fall Festival in September, or earlier. "We receive a minimum of three phone calls every day about when the skywalk will open. We literally had 50-plus calls per day during Fall Festival this year," Devlin said. Frank Auriemmo, like Devlin and area business owners, is also looking forward to the observation deck opening. Auriemmo just opened his Kinzua Country Restaurant, at 6 W. Main St. in Mount Jewett, on Dec. 3. "What brought me to this area is family, and that it's so peaceful and quiet. But I'm certainly hoping that the viaduct will bring customers in," he said. Tourism officials first lobbied the state to rebuild the viaduct but later focused on a $7 million project to build the skywalk and proposed visitors center and trails. The cost to rebuild the devastated bridge was estimated at $47 million. Port Allegany borough taxpayers do not need to brace for a millage increase in 2011, according to the proposed budget for the coming fiscal year. The proposed budget package totals $2,007,541, down from the current year’s $2,618,989 total. Water Department—$506,600 ($478,450); Sewer System—$675,100 ($1,193,168); and State Aid—$61,003 ($161,102). Borough secretary Susan Roboski said no millage increase is planned. The present tax rate for all borough purposes is 5.43 mills. The total millage is allocated as follows: 4.295 for general borough purposes, .37 for street lighting, .4 for fire protection, and .365 for the Samuel W. Smith Memorial Public Library and Bookmobile. DVDs Available - "Moments to Remember" DVD's will be available beginning Friday, December 17 at a cost of $12 which includes tax. Dotty Anderson and Howard Foster, members of the Port Performers, show off the finished product which can be found at S. W. Smith Memorial Public Library, Port Pharmacy and Joel Anderson's office located at 114 Smith Avenue. 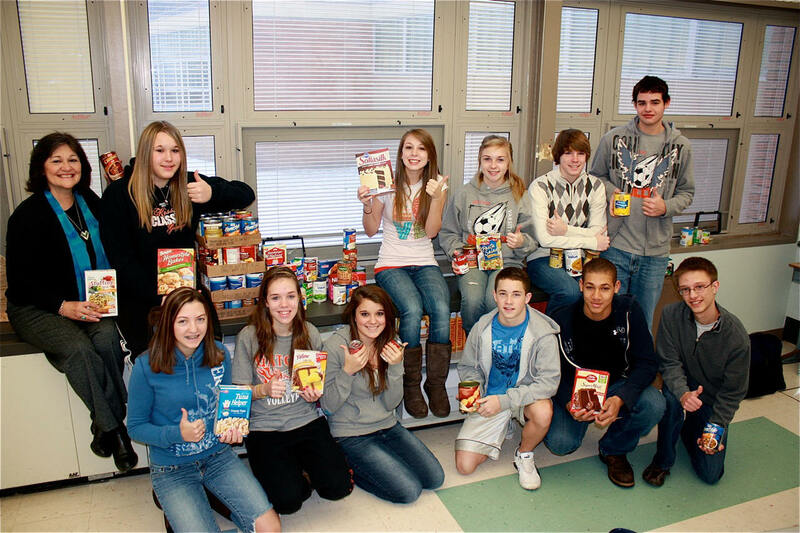 Competition Benefits PACS - The Port Allegany Peer Helpers sponsored a school-wide competition among the homerooms to collect non-perishable food items for PACS (Port Allegany Community Services). Peer Helper advisor, Linda Lane reported, "there was a cut-throat competition to beat Mrs. Daniel's homeroom, but Mrs. Lane's homeroom prevailed winning the highly prized donut party." Pictured are (front row, left to right) Kaelee Lindsay, Ashley Woodruff, Merinda Lawrence, Scott Brookens, Bill Downey, Cody Buchenauer; (back row) Mrs. Lane, Rachel Taylor, Sara Borro, Colleen Hardes, Franklin Austin and Logan Hults with some of the items they collected for PACS. 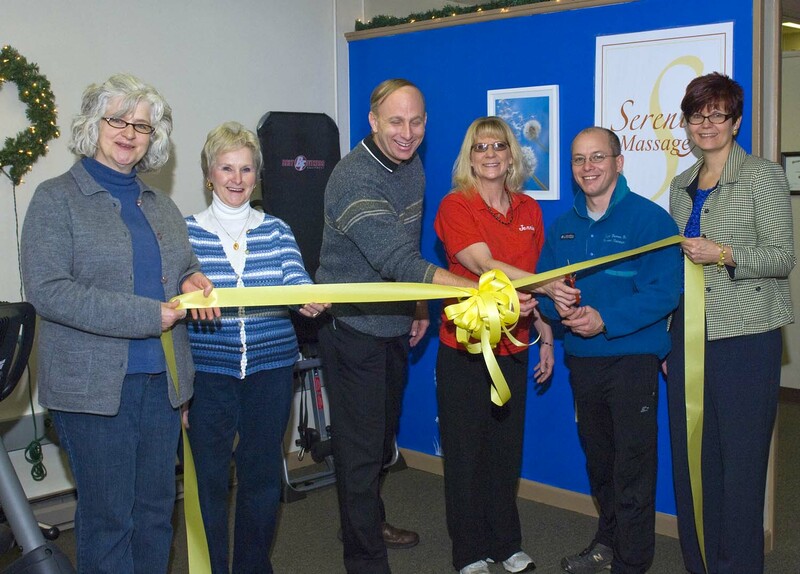 New Business Opens in Coudersport - A Ribbon Cutting Ceremony on December 3, 2010 at Serenity Massage’s Open House with the Coudersport Area Chamber of Commerce. In photo shown left to right: Jane Metzger, Carol Jackson, Stan Swank (Chamber President) Jennifer McCleary, Clay Gooch and Nancy Grupp. For the “Moments to Remember” production the Port Performers troupe included a number of performers and support persons who are part of the Potter Players. “Moments” was directed by the Potter Players’ veteran director, Paul Herzig. 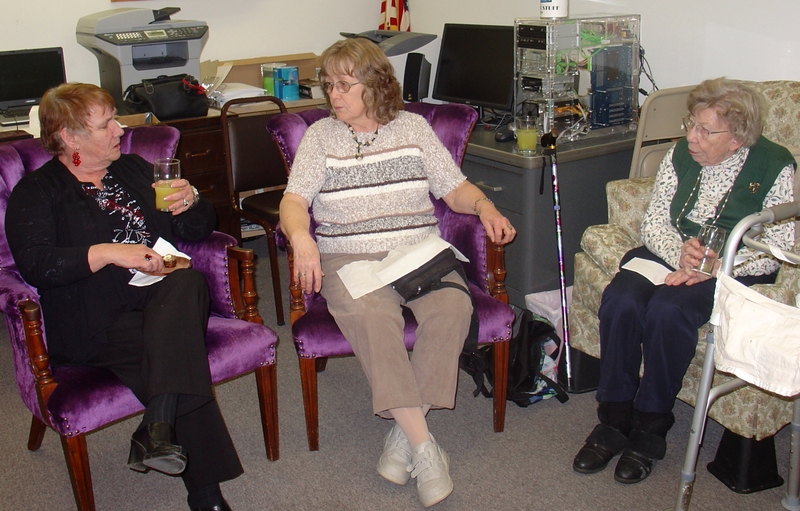 Others were drawn from elsewhere in McKean County. By including both counties the combined group hopes that more people will participate, adding to the enjoyment of all and making for even more flexibility in assignments. As Herzig explained, participation includes many kinds of involvement, not limited to singing and playing. Lighting, sound, staging, costumes, makeup, rehearsal accompanying, promotion, set design and creation, ticket sales, writing, arranging and many other tasks must be performed. Among kinds of productions the group may undertake in coming months are dinner theater, serious drama, musical revues and groups of ten-minute plays. A tentative plan is to present a revue featuring music from Broadway—possibly coinciding with alumni events in Port Allegany and in Coudersport, in the fall of 2011. There may also be a different kind of production in late winter or early spring. 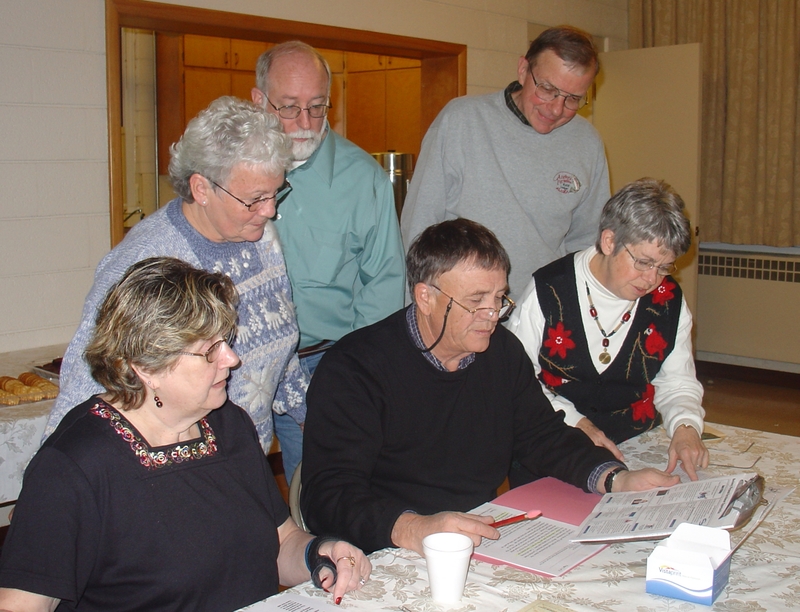 Some leaders of the newly combined Potter-McKean Players worked on plans Sunday afternoon, in the Port Allegany Lutheran hall. Director Paul Herzig is in the center. Others, clockwise from him, are secretary Ruth Sallade, McKean County vice presidents Anna and David Fair, and board members Joel and Dotty Anderson. The group is restructuring as a performing arts group with membership drawn from both counties, and performances to be presented in both. Membership is open to adults and students interested in any aspect of stage and musical productions. Because of the growing interest in acting, in the area, Herzig plans to teach an acting class under the auspices of the Potter County Education Council, at a location in Port Allegany. The class will be held one night a week for six weeks, with each class lasting three hours. There will be a $50 fee for the course, but members of the Potter-McKean Players will receive a $25 scholarship, effectively halving the tuition. Membership in the group itself is open to adults in the area, who have an interest in the organization and its activities, and fill out a questionnaire stating their interests, and previous experience if any. Students may join too, with those under 18 needing the consent of a parent or guardian. In addition to some hold-over members from the Coudersport area, the combined organization has added Port Allegany area vice-presidents Dave and Anna Fair. Newly added board members are Paula Moses, Ursula Rosenswie and Joel and Dotty Anderson. Other officers include Herzig, president/director; Jared Empson, vice-president/director; and Ruth Sallade, secretary/director. New bylaws have been drafted and the incorporation is being updated to reflect the enlarged territory. Board meetings will be held approximately four times a year, officers said. There will also be meetings for the membership at large. All meetings will be open to the public. The group plans to meet in January, probably in Roulette, at a time and place to be. On a recent interview with Santa Claus I had lots of questions. Sitting on a red chair in the lobby of the Crittenden, he answered patiently. Q: Were you always Santa Claus? A: No, I had to be trained before I could be Santa. A: I got my degree in Santaclausology from the International University of Santa Claus, at the Torrington, Connecticut campus. Q: Is there that much to it, that you have to get a degree? A: It’s a lot more than wearing a red suit and sitting in a red chair. There are safety issues. You need to know all about today’s protocols for working with children. There are many details to be mastered. Q: Is there continuing education? A: Yes. I am a member of the university’s alumni association, The Red Suit Society. We keep up with all the new rules and the art of Santaclausology. Q: When you encounter children with special needs, can you and they communicate enough for them to express wishes and for you to respond? A: Oh yes. Children are children. Part of what the University courses teach us is how to talk with all kinds of children. We must know how to hold them and how not to, what to say and what not to say, how to answer the difficult questions. Q: Some people dress up in outfits and wear wigs and artificial beards to do “Santa” appearances. What is different about being a degreed Santa? A: This is not a costume. Santa has a wardrobe. Mine includes this white shirt and red vest, black pants and boots, this red robe and big belt, this red hat. I do not wear a “disguise.” My glasses have prescription lenses in them. I did not buy my hair and beard—I grew them. I keep them groomed properly—I go to Robert Joseph Family Haircare, where Carrie is my talented operator. Q: Where did you get the satin shirt with the fancy trim? A: Marcia Heinzelman made it. She also made my vest, cloak and hat. I sent away for the special faux fur she used for the trim. Q: So is being Santa Claus a business or a calling? A: It is both. I am a member of the Coudersport Chamber of Commerce. Q: I thought there would be some soot on your suit, but it is clean as can be, and even the “fur” is snowy. How do you manage that? Is it a trade secret? A: Not a secret—everyone should know: it’s magic! Santa Claus has magical powers, after all. Q: So is that how your hair and beard stay so wonderfully white? A: No, that’s Carrie. Approximately every four weeks. I wanted to ask Santa many more questions, but a trio of little girls came in, with their mom and grandmother. Two of the children had business with Santa; the smallest one was an onlooker. Shyly at first, the two older girls approached the jolly fellow whose picture they had seen so often. The other little girl was taken with his walking stick and its lights and bells, which he let her examine to her heart’s content. The conversations between Santa Claus and his little clients were private, but I overheard enough to know there were mentions of stockings, and a visit, and cookies. Santa told me that he can be reached through “agent” Pete Wyatt at santa@coudysanta.com, or by calling 814.274.7445. Jaden Studer, left, seems to be making a case that she has been good all year. Her sister Camerynn Stambaugh looks as if she could fill Santa in on that. 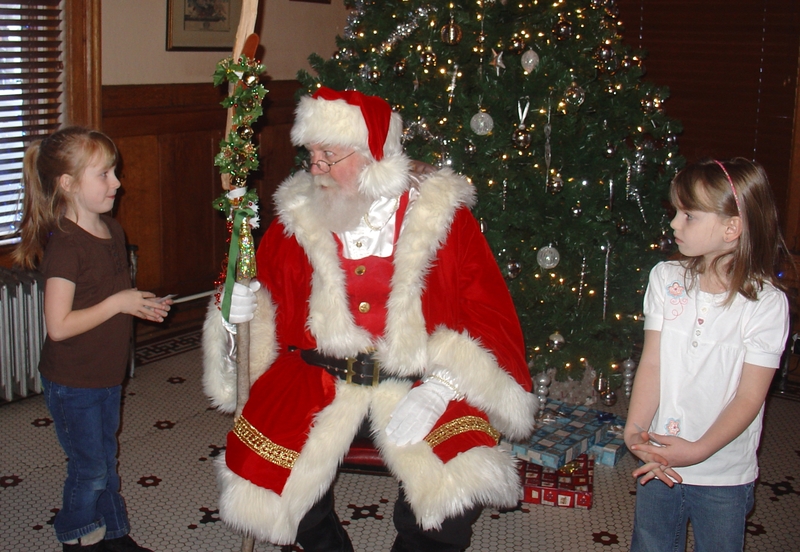 Santa chatted with them in the Crittenden recently. Tribute To The Voice Of The Gators – By our calculations, Al Lacher began his radio sports-casting career on or about August 31, 1990. Over the past 20 years, 2 decades, 1,040 weeks, the “Voice of the Gators” has logged countless miles, nearly lost his voice a time or two and entertained us through many, many, exciting, edge of your recliner football and basketball games. He braved the elements, day or night through fall and winter. Al Lacher is one-of-a-kind. May not be the type that wants this tribute and the attention it brings. Sorry friend, it’s well-deserved and needs to be said. Over the years he’s done an average of 180 regular season Gator Football games and a mere 640 regular season boys and girls basketball games as voice of the Gators. In the early years, additional miles were driven, other games were covered and others were fortunate to sit on the edge of their recliner as Al screamed across the airwaves about the latest “home” touchdown or 3-point shot. After 20 years of 16 regular season boys’/girls’ basketball games and 20 years worth of 9-game regular football seasons, we take this time to wish Al the best of luck. 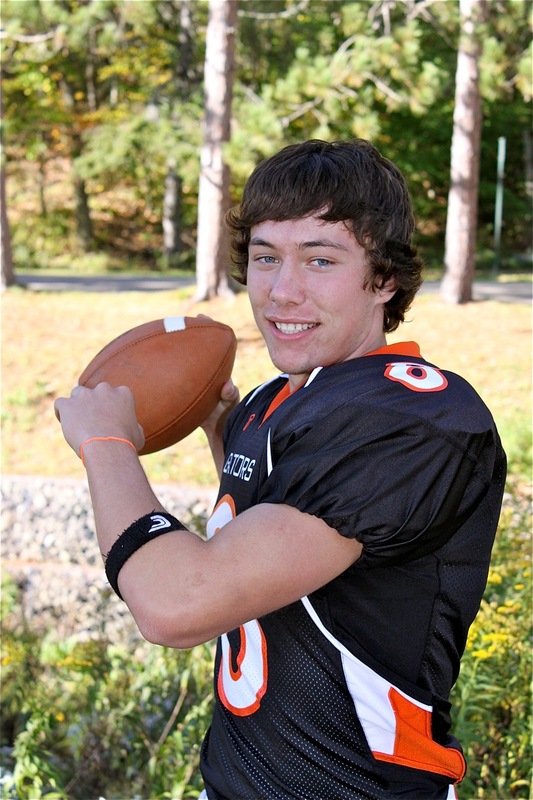 We know he and his voice will be missed by many in future seasons as the Gators take to the field or the court. Honored - Seth Lowery and Matt Bodamer joined the 1,000 yard club in the PAHS Gator Record Book. Lowery, a senior, had 1,011 yards rushing this season while Bodamer, a sophomore, had 1,992 yards passing on the 2010 season. They are pictured with head coach Mike Bodamer. They were presented with custom designed footballs commemorating their achievements during the annual football banquet. 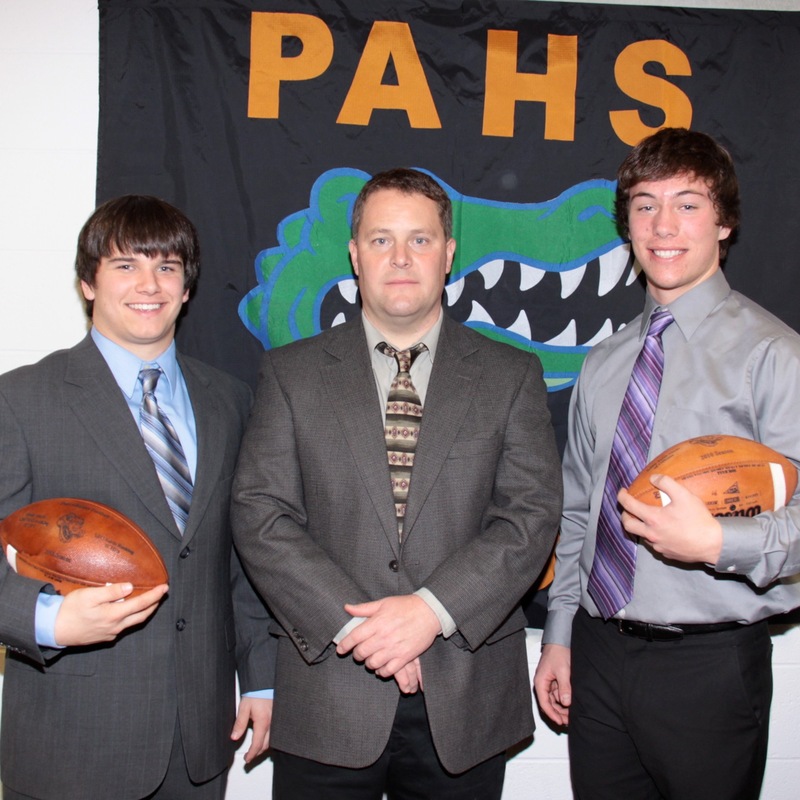 Guests of Honor - The Gator Football Banquet was held December 8 at the Port Allegany High School. Sponsored by the Football Boosters, recognized the players, coaches, managers and cheerleaders who participated in the 2010 season. Senior players posed for the R-A camera following the banquet. They are, left to right, Camrin Stuckey, Zach Manning, Seth Lowery, Ryan Kio, Zach Ramadhan, Garrett Kio, Ken Kysor and Benn Baxter. Master of Ceremonies for the event was Nate Zitnik. 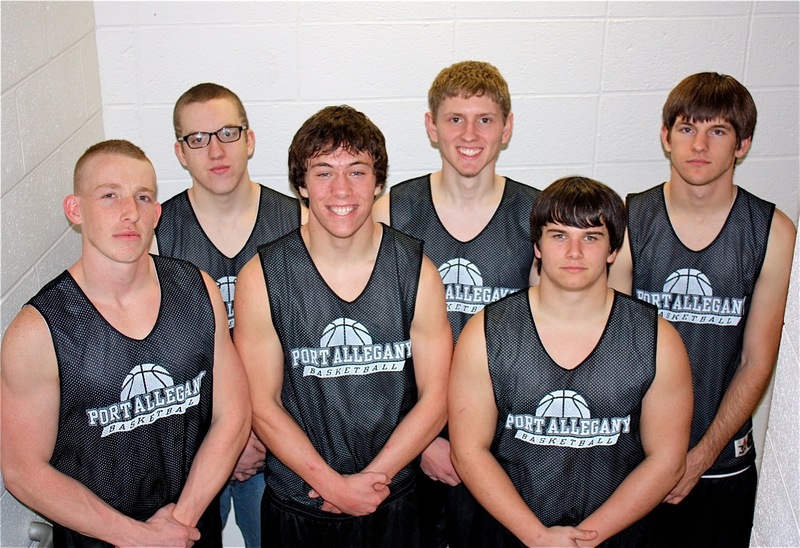 Returning Letterman - The Port Allegany Gator Wrestling Team returning lettermen are pictured (front row, left to right) Lucas Manning, Bryan Lacher, Thomas Caden, Troy Halle, Logan Warnick; (row 2) Alex Gular, Marcus Borowsky, Trent Neal, Chester Tanner, Brad Goodreau, Benn Baxter, Todd Bigley; (row 3) Cole Caulkins, Dalton Warnick, Ryan Kio, Zach Manning, Nick Budd, Wes Caulkins and Troy Bonser. The Gators are coached by Sean Lathrop. The team will host Sheffield on December 16. Lady Gator Returning Letter Winners - Head Coach Kristina Francis has five returning l etter winners for the 2010 - 2011 girls basketball season. They are Cora Bova, Renee Edgell, Rachel Taylor, Kyley Mickle and Bryanna Evens. The Lady Gators will host Bradford on Friday, December 10.